Meersbrook Park Road and existing avenue of Lime trees. The trees are a character defining and much loved feature of the street. A war of attrition between Sheffield City Council and protesters created from the highly controversial Streets Ahead programme has, at the time of writing, included the felling of 4,800 street trees to achieve road improvements. Headlines like ‘Sheffield’s Street Tree Massacre’ have brought the stories of dawn felling, pensioner and councillor arrests, and high-level celebrity, political and expert public support for the tree campaigners to national attention. This telling will be from a landscape professional’s perspective, sticking to the broad themes and possible lessons of most relevance to our profession. Streets Ahead is a public-private initiative, valued at £2 billion, between Sheffield City Council and Amey, tasked with improving and maintaining the quality of Sheffield’s roads from 2012 for 25 years. It sets out to upgrade and maintain all adopted roads and has been actively promoted by the council for the functional and environmental benefits that it will bring. If you have visited Sheffield, I am sure that you would agree that these are laudable aims, given the city’s reputation for pot holes. However, Sheffield is also known for much more than potholes, including the quality of its environment, to which the street trees make an important contribution. The character of many a street is defined by a statuesque corridor of mature trees. The city is hailed as the greenest in Europe and as a consequence most citizens enjoy and celebrate a distinct and high-quality urban environment. Indeed, these attributes are recognised and promoted by the council through its marketing of Sheffield as ‘The Outdoor City’. After moving to Sheffield in 2012, I was keen to know how the objectives of Streets Ahead would be reconciled with the existing assets of the city. Also, I wanted to know if opportunities were to be taken within the upgrade works, to improve the multifunctionality and efficiency of Sheffield streets, in line with aspirations for green infrastructure. For example, through traffic management initiatives, improving and introducing cycle paths, the creation of home zones, stormwater management techniques, improved ecology, enhanced character, productive planting etc. There are endless possibilities for what a street can accommodate and this appeared to be an excellent and once in a lifetime opportunity to address their viability in Sheffield, to ensure the city was working towards its best. Unfortunately, it quickly became apparent that the vision for the streets was more prosaic, much more narrowly conceived, without due consideration to assets and opportunities and that this would bear regrettable and perhaps unanticipated consequences throughout the city. Save Our Rustlings Trees (SORT) is a resident group with concerns about the future of trees upon their road and the perceived insensitivity of the highway proposals. Rustlings Road composed a long stretch of large healthy mature trees, many of which were considered by the council and Amey incompatible with the intended standards of highway improvement and maintenance. Tree identified for removal based upon damage caused to the surrounding footpath. The reasons given related to perceived damage and discrimination, two terms the council often used to describe problem trees, in addition to the conventional arboricultural terms ‘dead’, ‘dying’, ‘diseased’ and ‘dangerous’. ‘Damaging’ trees were trees claimed to harm footpaths (e.g. causing misalignment of kerb lines) and ‘Discriminatory’ trees were those perceived to create difficulty for elderly, disabled and partially sighted people (e.g. creating bumps in tarmac). The residents were concerned that the damaging and discriminatory claims were being made at best, spuriously, and even if credible would certainly not form an insurmountable challenge to the retention of the trees. Upon inspection, I agreed with the residents that the council were not endorsing a balanced and common sense view and had seemingly not considered existing assets alongside potential. 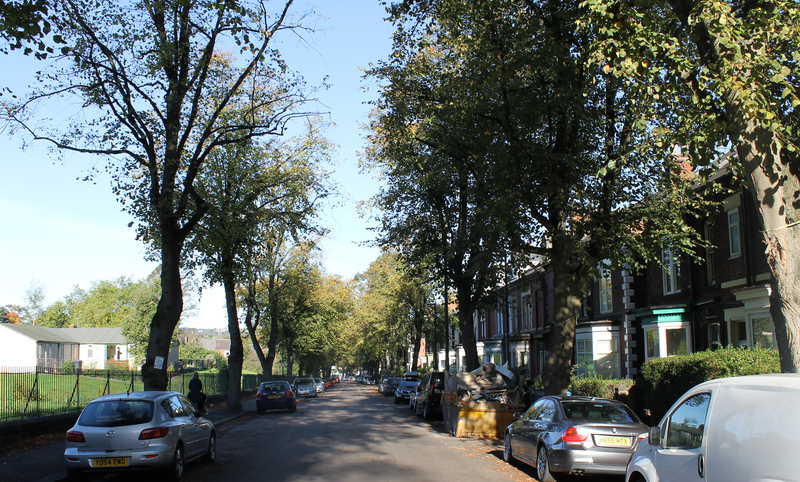 For example, a number of large healthy trees, important to street character, personal wellbeing and ecology, were being proposed for removal due to small or shallow bumps in the pavement that defined them as discriminatory. I worried that Rustlings Road was an example reflecting policy across the city; thousands of streets and trees. I therefore joined other petition signatories in requesting a meeting with the local authority to discuss alternatives. 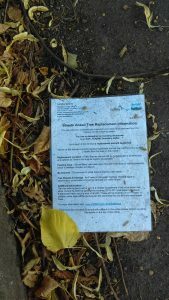 SORT and subsequently the Sheffield Tree Action Group (STAG), a city wide collaboration of concerned individuals, became very effective at promoting their apprehensions and criticisms, through social and conventional media, and successfully lobbied the council to stage a public meeting. The meeting would be a platform for each side of the issue, but the council were very clear it was not a consultation event and that they would not accommodate any change to the programme following the meeting. 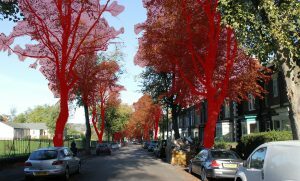 The red shading gives an impression of the trees to be removed within the Streets Ahead programme and the consequent effect. This represents approximately 40% of the trees along the route, all healthy, to achieve an unnecessarily high footpath standard. On the council website there was, until recently, a justification that the scale and likely contention surrounding the programme rendered a full consultation unfeasible. To me, this is a perverse conclusion from a statement that appears to encapsulate the precise reasons for a city-wide deliberation. Sheffield City Council stridently defend the ambitions of the contract: to improve Sheffield’s streets, and maintain that trees are only to be removed if they are categorised as either dead, diseased, dying, dangerous, damaging or discriminatory. Furthermore, the council are clear that the contract will not result in the deterioration of a city asset, since it intends to replace felled trees at a one-to-one ratio with appropriate species. They also maintain that the programme is supported by the majority of Sheffield residents. The protestors passionately portray the benefits of mature trees for the raw enjoyment and sense of wellbeing they contribute to their lives, as beautiful and street character defining specimens, softening urban form, reflecting seasonal change and host to wildlife. In addition, they reflect the very practical function of mature trees, for their ability to mitigate the effects of the urban heat island and climate change. They castigate the council for not considering these wider concerns and consequently not identifying trees as an asset for consideration at the project outset. In addition, they claim that the trees have not been financially valued for the benefits offered through ecosystem services (e.g. prevention of flooding, alleviation of air pollution), so the loss of asset is unknown and did not form part of the calculation for removal. Nor, they say, has the project been developed within the context of a city wide tree strategy. Rather irrationally, a new tree and woodland strategy for Sheffield is planned to follow the felling programme. Rather like a surgeon testing for reactions after amputating a limb, some say. Many industry and technical experts, including representatives from the Woodlands Trust, Trees For Cities, Sheffield Wildlife Trust, academics – including professors from Sheffield Hallam and the University of Sheffield’s own landscape architecture department – and many highly accomplished arboriculturalists continue to validate and bolster the protestors’ position, sharing a common belief that Sheffield street trees represent a unique and essential asset to the city and should be accommodated where practicable for purposes of amenity and environmental resilience. ‘Streets Ahead Tree Replacement Information’ explaining grounds for tree removal. A common assertion is that now is not the time to compromise urban tree stock. If anything, it is the time to plant more. They condemn the lack of consideration for trees within the contract and criticise both the motives within the contract and triggers for removal, together with the absence of meaningful efforts to find solutions for retention. Three key themes are emphasised. The first relates to the projected useful life of a street tree: whereas the council claims many of the trees planted in the late nineteenth/early twentieth century would benefit from replacement, based upon adapted methodology for determining the optimal rotation rates for tree crops, some estimates suggest that felling a typical street tree, such as lime, would occur closer to 270 years after planting, if the objectives were to manage benefits over time. The second disputed point regards the proposed ratio of replacement. All professionals maintain that in order to sustain the positive contribution of street tree stock to the health and vitality of the city, the tree replacement ratio needs to be much in excess of one for one, with some critics claiming the rate should be closer to five. Finally, and certainly the most worrying indictment of the Streets Ahead policy, relates to best practice regarding highway standards and trees. Section B.5.46 of the Department for Transport commissioned document ‘Well-managed highway infrastructure: a code’, states that ‘extensive root growth from larger trees can cause significant damage to the surface of footways, particularly in urban areas. A risk assessment should therefore be undertaken with specialist arboricultural advice on the most appropriate course of action, if possible to avoid harm to the tree. In these circumstances, it may be difficult for authorities to reconcile their responsibility for surface regularity, with wider environmental considerations and a reduced level of regularity may be acceptable’. Such guidance has been repeated on multiple occasions and makes clear that concessions within streets between highway aspirations and trees are possible and conventionally regarded as desirable. Amey and Sheffield Council, however, have to date pursued a more zealous/aspirational application of highway standards, with little tolerance allowed for acceptable deviations, or trees. In summary, the professional consensus appears to be that the trees cannot be justified for removal based upon arboricultural or highway grounds. That I am aware of, there are no public examples of a technical expert independent of the contract in support of the current council policy for felling. I do not feel it is an oversimplification to summarise the issue in the following terms. From the council’s perspective, they have correctly identified a problem with bumpy roads and footpaths and they intend to solve it by making them smooth and flat, whatever the consequence. This solution appears logical, if streets were only appreciated as conduits for conveying cars and people and could accommodate no additional asset or function. As landscape professionals we know that to be untrue. Streets form a significant setting to our lives. We may sometimes drily commute upon them, but we also cheerfully stroll, jog, chat and play within them and happily settle upon them. Journeys and activities for which the setting is incredibly important, contributing to our sense of health and well being. More tangibly, streets are able to house numerous very practical functions and services, from the common and essential, including the ability to communicate people and information through roads, paths and wires, to cables and pipes for power and waste. Green elements, including trees, offer further opportunities for amenity and function, providing attractive living sculptures that also have the incredible ability to provide for nature and ameliorate our environment. The task of good design here, as with any other space, and as advocated within the term Green Infrastructure, is to take opportunities and to use resources economically, providing multifunctional streets that are integrated with and beneficial to the context. Given the complexities and inherent potential of a city street, I believe such projects and their objectives should have been forged from a collaborative multidisciplinary team, including arboriculturalists, landscape professionals, ecologists, highway, civil and drainage engineers and probably a good few more, in conjunction with the Sheffield community for which the works are intended to benefit. This pooled technical and community expertise would likely have contributed a bolder vision, a better understanding of opportunities and constraints within the project, and innovative solutions that exploit the potential of the situation. The Streets Ahead project is truthfully a highway project focused upon delivering smooth tarmac, despite the environmental claims otherwise. It was likely formed with the best of intentions to solve a single perceived problem, that of potholes, but the objectives and mechanisms for delivery derive from a narrow perspective, that of highway engineers and councillors. I am certainly not criticising highway engineers, but I am emphatically criticising silo working, as it can offer only a narrow view for what is important, does not embrace collaboration and therefore does not exploit design opportunity. For Sheffield to have achieved a better outcome, I believe they needed a bolder vision, which appreciated the potential of a street in its broadest sense, recognised and pursued by a multidisciplinary team that understood the existing assets. And of course, these proposals should have been developed alongside the citizens of Sheffield to ensure that the project reflected community interests, promoting real engagement and ownership. These feel like relatively modest aspirations given the scale of the project. However, the reality is that Sheffield feels like a big opportunity missed, with the Streets Ahead programme an ironic title falling woefully short of its potential. As a consequence, the public will has been frustrated, the council have suffered tremendous damage to their reputation and the city will bear a poorer environment. Perhaps a tough lesson on narrow ambitions meted out to Sheffield, but hopefully learnt by others. Steve Frazer CMLI is Principal Landscape Architect at Enzygo Ltd, Sheffield. Its so hard to believe that in this day and age the Council are taking such a narrow view. In my experience the service authorities always win over and will not allow replanting within so many meters of their pipes and cables and so the once splendid street trees cannot be replaced, or at best they are replaced by small ornamental’s that do almost nothing to make up for the lost grandeur. Its too late when the trees are gone and the excuses flow in. We did intend to plant replacements but the service authorities wouldn’t allow it. We’ve heard it all before. I studied at Sheffield in the 1990’s and saw how good landscape architecture transformed parts of the city that had struggled for a number of years following the economic slump of the 1980’s. It seems the council have lost their landscape mojo and have resorted to ridiculous. jobsworth type statements like this in pursuit of ticking boxes that don’t need to be ticked. Yet another case of well meaning people that know little about a subject being given the power and authority to ruin it for everyone else. Sad to see, short sighted and misguided. Excellent Blog, thank you Steve. I think that Streets for Cities should actually read Trees for Cities. Great piece and needs to be placed In front of every Sheffield councillor and the cities legal team for signing up to a contract which removed any mechanisms for control and review without hefty financial implications. Steve, at last a built environment professional other than an arboriculturist/forester speaking out against what is happening in Sheffield. Well done for standing up and being counted. It is a shame that there has been silence from the engineers, the profession that is administering the harm. On 28th July 2017, BBC Look North informed that around 5,400 of Sheffield’s MATURE STREET TREES HAVE BEEN FELLED (an audio recording exists. Also, see: https://www.youtube.com/watch?v=3RX8H48ArOU ). In 2007, the survey that was used to make the business case for the £2.2bn PFI contract, and used to form the Streets Ahead highway maintenance contract, only found that 1,000 were classed as dead, dying or dangerous. OVER 5,500 STREET TREES HAVE BEEN FELLED! Very well said Steve, I hope you or the LI are going to share this with local press in Sheffield and the national press? 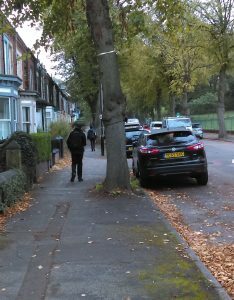 Thank you, Steve Frazer, for writing such an excellent summary of the current travesty of Sheffield City Council’s mismanagement of our street trees. The more that we can raise awareness of the decimation of healthy trees in a highly polluted city the better. This is a really well balanced and thought provoking piece. Thank you Steve Frazier for pulling this together so succinctly. I urge all who read it to share this widely with their networks. This is a cautionary tale whilst other councils are likely to be watching and waiting. My own council Wandsworth, has successfully managed to fell an avenue of mature Chestnuts on Tooting Bec Common despite significant public outcry and disparate scientific evidence. This was less of a clean sweep as for Sheffield but it demonstrates the need to apply consistent evidence of benefits associated with mature legacy trees and the opportunity for this evidence to be considered properly when challenged through the planning process. It also demonstrates how selective, often narrowly focused justifications eg on H&S risks can be used legally to enforce mass destruction of high quality green infrastructure. Thank you so much for this clear and concise overview, it’s shocking, scandalous and fatal to our city. I really appreciate your professional view of the situation, thank you so much. Thank you also David Long for articles, I couldn’t locate Sheffield Star article (dated February 2013 I believe) in which both Councillor Jack Scott and Steve Robinson were each quoted as saying “1,250 total to be felled”. In actual fact nearly 6,000 have been felled to date. It’s incredible this is allowed to go on, it’s criminal, environmental vandalism of over £66 million worth of citizens’ assets and an incredible waste of £2.2 billion investment, as it’s ruining Sheffield not improving it. I sincerely hope SCC will reconsider accepting help (and even further) funding from experts and organisations readily willing to give it. Before it’s too late and SCC press ahead with felling 18,000 which has apparently been mentioned in several articles too. No one knows what to believe and mistrust is understandably rife everywhere, including within family, friends, neighbour and community sadly. We had 36,000 street trees in Sheffield, 18,000 would be half gone irretrievably tragic on many levels. Thank you for support. A Blog Entry By Harry Watkins (Principle consultant at “Rootstock”: a Sheffield consultancy for landscape architecture) A landscape professional that actually bothered to make an effort to stand up for professionalism and oppose bad practice! Thanks for sharing that article. I removed the full article copy from your comment so as not to dilute Harry’s potential readers – I left the link to the article intact so people can visit the Rootstock website directly if they wish to read the piece. Translated in to plain English, what is that supposed to mean? The LI can’t take criticism? Perhaps you should create a separate blog entry for the piece by Watkins, so as not to appear to favour the contribution of one landscape professional over another? People reading the article in full in the LI comments section are unlikely to visit Harry’s website to do so, hence my concerns about diluting his readership. I left the link so people may visit the primary source if they so choose, and examine this debate from another perspective. To be fair, they both share the same perspective. The main difference is that Watkins believes the LI should pull its finger out and formally criticise SCC & Amey for their malpractice. At the end of the day, the LI spouts many fine words but appears to be either unwilling or unable to take action to aid positive change in legislation, policy or practice – detached from the real world (much like the Arboricultural Association). The only realistic option we have left is a city wide vote of no confidence in the council. Its administration is no longer fit for purpose. A new, publicly owned and democratically administered organisation should be set up to break up the old decrepit council and build a new one. Perhaps I have been a bit harsh on the Arboricultural Association. They have spoken out on a couple of occasions, albeit to say precious little, and very late in the course of events (better late than never!). See below. Barrell Tree Consultancy managing director Jeremy Barrell attacked Sheffield’s street tree removal programme on last night’s (4 January) One Show on BBC1. Interviewed by presenter and veteran DJ Andy Kershaw while inspecting felled and soon-to-be-felled trees in the city, Jeremy Barrell said: “From a health and safety point of view they are fine – none of them need to come out. Horticulture Week – 5 January 2017. Author: Gavin McEwan. A ‘bolder’ vision. Well yes, that’s entirely the problem being as it is, limited by nothing more than an unholy alliance of public and private, providing a prime example of how not to conduct such an arrangement. The bolder vision is lacking due to not only to a lack of imagination and rigorous intellectual analysis but also the councils emphasis on a business plan/worldview as opposed to good governance. I was at the LI AGM and I wondered why there was not a motion condemning the actions of Sheffield City Council in this. I thought perhaps I didn’t know enough about it. As a former resident of Sheffield I too have many memories of all those wonderful streets full of big trees. It sounds as if the project is totally stupid and will ruin the streetscape for several generations to come. Can the Landscape Institute condemn this policy? At one time landscape architects signed up to look after the landscape for future generations, I think that bit was removed from the creed a long time ago. Perhaps it should be put back in. Would Amey accept an alternative contract to carry out ‘Best Practice’? Very interesting topic to learn and get some tips on the importance of trees to us and to the environment. Thank you for sharing this great blog!